Yesterday was a red letter day for me. Last night, after many years of wanting one, I won a Pedigree Walker on eBay. I already have a walking doll, my childhood doll Christine but she is not made by Pedigree. I love the faces of the Pedigree girls with their flirty eyes and cute expression. 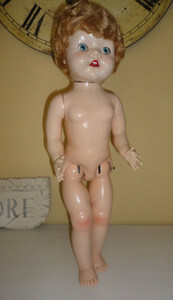 I made up my mind to get one and to make it harder on myself she had to be a twenty inch or larger doll. They are not particularly rare but very sought after by collectors and usually go for way more than I can afford. I realised that I was probably going to have to buy one that had a few issues but as my own dolls are by no means in perfect condition I wasn’t that worried. I would draw the line at missing or broken limbs but a bit of fading, lost eyelashes, non-working mama’s and even minor body damage was acceptable. This girl came up for auction recently and although she is has a crack in her body she’s a one owner doll and I think she will be fine to display once I get her dressed. Unfortunately, there is no Dolls Hospital here in Tasmania, not one that I know about anyway so she will have to wait until I can take her to the mainland to be repaired. Will this be the end of my obsession with these dolls? I’m not sure. Once I have this one restored and dressed I may be happy to move on to something else but I have seen such a lot of lovely examples of them that it’s quite likely that I’ll keep on browsing for them on eBay and try to get another one. Previous Skipper Turns 50 in 2014!